On Saturday February 16, my latest area public sculpture, The Diary was unveiled at DJ’s Dock on County Highway B east of Hayward, Wisconsin. The poignantly themed sculpture is dedicated to the loving memory of Catherine Arnold who during her life was touched by Alzheimer’s disease. Catherine’s son Jamie and daughter-in-law Deanne, who own and operate DJ’s Dock on Round Lake http://djsdock.com/ commissioned the sculpture to honor their mother and advocate for Alzheimer’s diseases support. The unveiling was in conjunction with the 15th Annual Chili Cook Off at DJ’s in which the Arnolds invite the local community and visitors to financially support the Sawyer County Alzheimer’s Association advocacy efforts. A full day of activities including silent auction, raffle drawings, cash raffle, chili feed, entertainment and even fund raising minnow races brought awareness to Alzheimer’s disease and raised significant funds for advocacy support. The sculpture unveiling united those in attendance in a touching remembrance of those effected by Alzheimer’s disease. The sculpture invites the viewer to reflect on the challenges faced by Catherine Arnold and her family as the disease progressed. Next spring, when permanently installed on a glacial boulder outside of DJ’s Dock, the sculpture will be a destination for others to pause and reflect on the impacts of the disease. The striking image will offer a message of hope for a future cure. 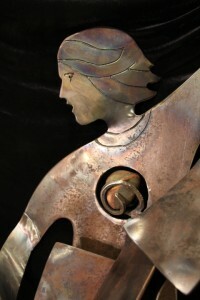 Fabricated from three eights and three sixteenth inch Corten steel, the sculpture’s steel components will oxidize over time adding a deep reddish patina to the figure and book. The stainless steel stars attached to the top most part of the book pages will shine brightly projecting a message of hope. The imagery of the sculpture provides a telling tale of life with Alzheimer’s. 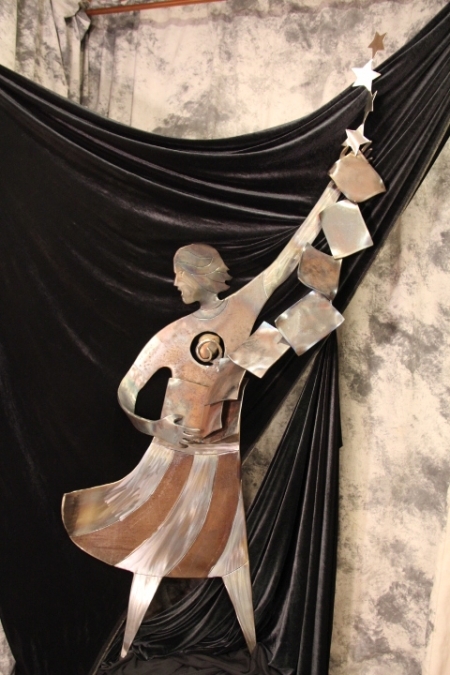 The youthful female figure depicts Catherine Arnold who walked on in life from the effects of Alzheimer’s disease. In her hand is a book, her diary in fact that contains a life’s worth of memories, experiences and emotions. The pages rising from the book depict the memories of Catherine’s husband Paul and her children: Cathy, Paul, Mary, Pete, Phil and Jamie drifting away. In the center of the figure a heart rock represents the deep set feelings and emotions that stay in tact with the person while other life experiences are lost. From the top of the book pages four stainless steel stars show the transition to the spiritual world where memories are kept in eternity. The glimmering stars project an image of hope for the future. Finally I wanted to share this Alzheimer’s disease poem created by my friend Naomi Cochran titled The Barbershop.